Micro-joints (or “shake and break”) are an easy method fabricators use to separate multiple parts from a sheet of material. The method places small, interconnecting tabs between parts by programming spacing of the slitting punch. The tabs keep the sheet and parts intact during punching, but make it easy to separate off the press. There are times, such as nesting of really small parts, parts too big to be blanked or corners, when a micro joint is not possible. In these situations, fabricators often use a wire joint. While this works, wire joints leave spurs on the edge (right), which, unless removed, could interfere with other downstream operations such as bending. Using a Square EasySnap™ tool (right) solves these issues because it leaves a smooth edge and makes parts removal fast and simple. Like EasySnap™, Square EasySnap allows fabricators to simply snap punched components out of sheet metal. 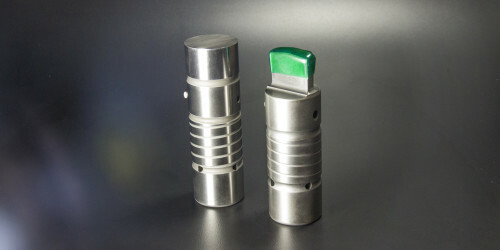 Square EasySnap features a V-line stencil machined onto the face of the upper and lower tools. As the tools penetrate the sheet, they create a line of weakness (snap-line) in both surfaces of the sheet metal. The sheet metal can then be snapped apart by bending the material along the snap-line. The actual depth of penetration and force required to snap the part is dependent on the ductility and thickness of the material being punched. It also keeps parts removal easy since the parts simply snap off the sheet. Nesting very small parts in a large sheet (photo, right). Sheets where the parts are too big to be blanked to make sure they will not fall away during the punching process. Putting the Square EasySnap away from the corner so there are only 2 sides of the tabs holding the sheet make it easier to break along one line. Rounded part corners where a corner micro-joint is not possible.